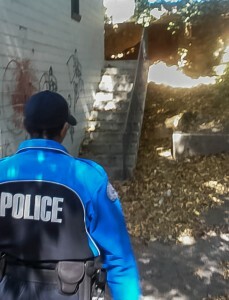 Officer Tedra Eberhart-Lee inspects an abandoned building near campus. edra Eberhart-Lee did not come from a family of law enforcement, but in her two-and-a-half year career as a Georgia State police officer, she has quickly learned how to protect people. While major crimes on campus are few and far between, Eberhart-Lee has been involved in two foot chases over her two-and-a-half year career at Georgia State. Eberhart-Lee’s first foot chase started near the Aderhold Learning Center and involved a theft. The suspect was cornered in a maintenance room of a nearby building, Eberhart-Lee said. Her second foot chase took place behind the College of Education near the Five Points MARTA station and reportedly involved a non-student and drugs. At Georgia State, officers work ten-hour shifts, four days a week to ensure areas are covered by more officers during peak times, Eberhart-Lee said. Most of an officer’s ten-hour shift is dedicated to patrolling one of three campus zones. The residential zone covers Greek Housing, Freshman Hall, The Lofts, Piedmont North and the Commons, as well as the parking decks for those buildings. The east zone covers the largest area of Georgia State’s campus. Buildings in the east zone include Urban Life, the Petit Science Center and the Sports Arena. Georgia State Athletics’ practice field located at 188 Martin Luther King Jr. Boulevard is also in the east zone and is patrolled several times per day, especially before athletes and coaches arrive in the morning. Georgia State recently acquired property on the east side of Interstate 75/85 on Fort Street near Irwin Street. University police also patrol that area, currently inhabited by a condemned apartment complex, when in the east zone. Officer Eberhart-Lee said vagrants and drug users are cleared from the area during the early morning patrols. The west zone, a zone with the greatest mix of businesses and students, extends from Peachtree Center Avenue to Cone Street and includes Aderhold, the Rialto and Woodruff Park. Broad Street is another area where University Police patrol regularly. In addition to classrooms at the Aderhold Learning Center and its proximity to the Rialto, Broad Street is a popular destination for students seeking food and panhandlers seeking handouts. “I’ve had to tell homeless people sleeping along Aderhold to move along,” Eberhart-Lee said. Police also visit businesses located on campus to build relationships and get updates on suspicious activities. Eberhart-Lee said noise complaints and disorderly conduct are the top grievances from restaurant owners on Broad Street. For students, though, theft is the most common crime on campus, Eberhart-Lee said. Theft by snatching and theft of “lost/mislaid property” are reported almost daily. Eberhart-Lee said theft can be reduced if people are aware of their surroundings and their belongings. Parking lots are also common places for crime. Electronic items are targeted in vehicles, so if those items are visible or vehicles are not secured, thieves may strike. Cell phone thefts are greater when students display their phones and are not watching where they walk, so it is wise to keep phones close and eyes forward, Eberhart-Lee added. When it comes to reporting crimes, “things that stand out like hair, tattoos, gender, distinguishing marks and accurate clothing descriptions make suspects easier to spot in public,” Eberhart-Lee said. Georgia State’s police headquarters is located at 15 Edgewood Avenue on the south side of Woodruff Park. Officers are also stationed at residence halls and several buildings during peak traffic hours. Additionally, security guards employed by the University Police are stationed at newly acquired property such as the SunTrust Building and at sporting events.